Fresh off the heels of his three-week comix residency at the Atlantic Center for the Arts in Florida, "master artist" Dean Haspiel and his eight associates did a storytelling exercise where they illustrated text written by Haspiel in nine different ways. 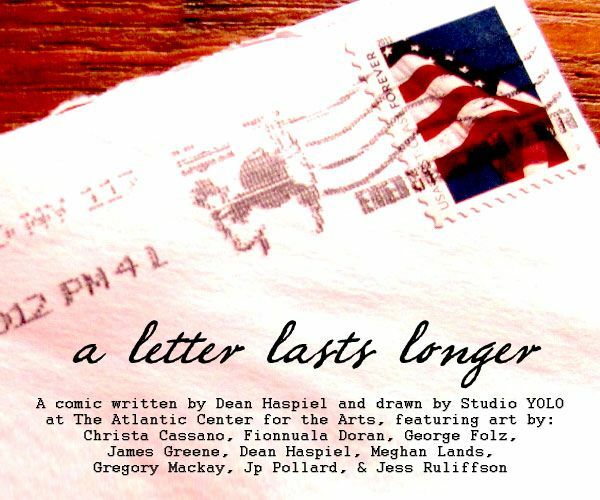 "A Letter Lasts Longer" celebrates the power of comix while spotlighting the poignancy of interpretation. "It’s fascinating to click through eight comics and see the differences — and the similarities — in the ways the creators interpret the script. It’s just a scrap of reminiscence about receiving a letter from a man as a small child, and the reflection that letters last longer than computer media. Most of the cartoonists took this to be the story of a father writing to a child, but George Jurard imagined it as a love letter in a remarkably rich and detail-filled comic. And while most of the artists used fairly conventional paneling, Jp Pollard and Christa Cassano spread it out across the page in interesting ways. Haspiel himself also drew a version of the comic, and the whole group makes an interesting exercise in compare-and-contrast."